These fanciful Christmas wreaths are beautiful and unique. Our super elves handcraft each one of the fresh wreaths from the finest evergreens. The Winterberry Christmas wreaths are for the nature lover for sure. The country-style red linen bow, handfuls of red berries, and two lovely cardinals are a perfect match atop the pristine forest greenery. Cardinals are such an important part of the holidays with many traditional and even spiritual meanings. According to the Universe of Symbolism, the beautiful red birds can symbolize power, wealth and enthusiasm. Their experts tell us, "Knowing what you want and how to get it is the central power of the cardinal." They continue, "In the midst of the bustling holiday season we may need to summon the cardinal as a guide to take in the true meaning of this special time. The cardinal can be a symbol of a strong family." Christmas Forest elves Landra and Angie create these extra large fresh Christmas wreaths. They both have been making wreaths here for over 20 years so they are definitely experts at what they do. 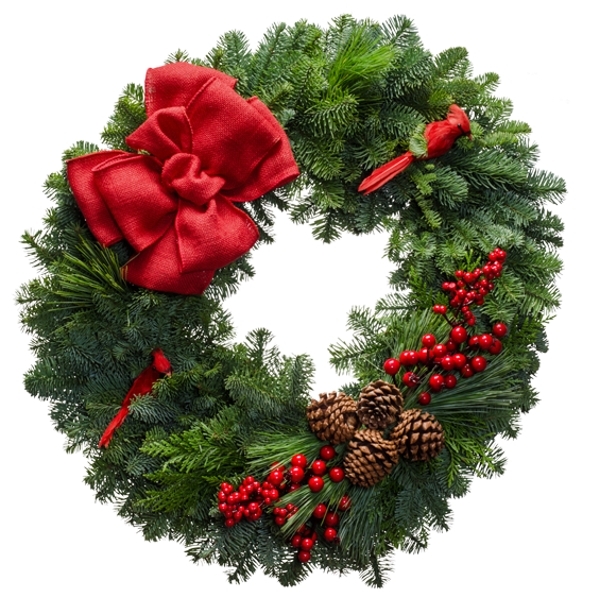 Order one of these outdoor Christmas wreaths for everyone on your gift list. You�ll want to leave this one up on your front door all winter. "Thank you! You guys have the best customer service I have ever received, year after year. We love the Christmas wreaths!"